Having a landscape in your yard or garden is one way to create a space that could reflect your personality to others. Whether you’re starting from scratch or you’re looking for ways to improve your existing yard, if planned well you can create a masterpiece that can add to the beauty of your house. People generally tend to think that creating these landscapes could cost them a fortune and require most of their time in maintenance. However, creating a modern and beautiful landscape in your yard doesn’t necessarily have to cost a lot. There are several ways that could ensure that the landscape you build will significantly reduce the amount of time spent on garden or yard maintenance. These ways not only save your time but also are cheaper and easy to build. If you want to get ideas about how to turn your yard into a beautiful and low maintenance landscape, this article will help you. This article focuses on the ideas, which includes the information about the plants you should grow, spaces you need to keep, designs that you could implement and others that you can use in your yard to turn it into a low maintenance landscape. Plants and flowers are the most important aspects of a landscape since they provide the all-important look and feel to your yard. Planting the right plants in your yard will not only add to the beauty but also will make sure it requires the least maintenance. You can choose various types of grasses, plants, shrubs, flowers, and trees that can turn your yard into a beautiful landscape. Perennial plants are those plants that return year after year, unlike annuals that live only for a season. Since these plants return year after year, you don’t have to buy plants for your yard every season. This will save a lot of your money and your yard will be covered with plants. You can use a single plant type to cover your complete yard, or you can also use different varieties of perennial plants. These perennial plants are considered to be one of the best bulbs for providing flowers throughout the seasons. 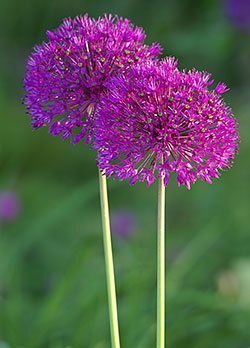 They have beautiful oval, globular, or spherical, flowers that bloom with magnificent colors on tall stems. You can easily plant them in the fall and the flowers will start coming in the summers. 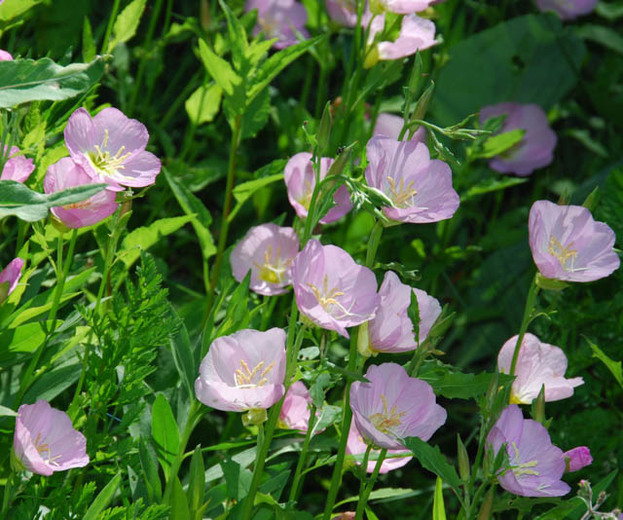 These plants require partial or full sunlight to bloom and can be planted anywhere in the yard. Also known as False Indigo, these plants are a great presence for your landscape. These plants are exceptionally long-lived, this is why it’s recommended that you select a good shrub sized space where you can plant them. 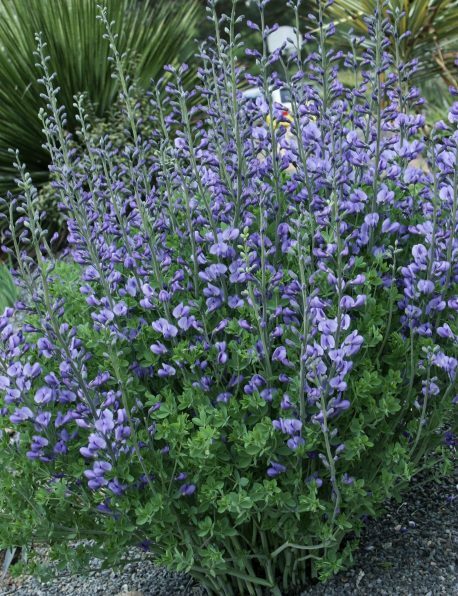 Baptisia has blue-green foliage and is topped with spires of lupine-like flowers that grow in the spring. These are bright perennials, some of which are used as herbal remedies. These plants are drought-resistant and are easy to care for. 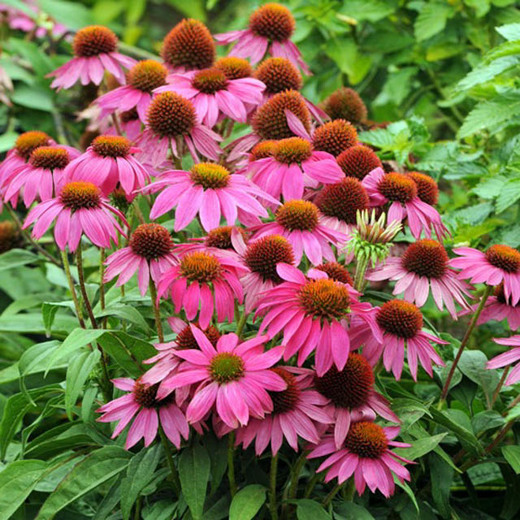 Coneflowers need full sunlight to grow and its flowers are daisy-like with raised centers and bloom in summer and fall. The flowers are beautiful and they come in various colors, like pink, purple, red, and white. If your yard is partially or completely shaded, don’t be disappointed thinking that you can’t have plants in your landscape. There are many perennial plants that favor light shade and don’t need sunlight to grow. Here are some of the plants that grow in shade that can make your landscape beautiful and low maintenance. These plants come in different varieties and vivid colors. 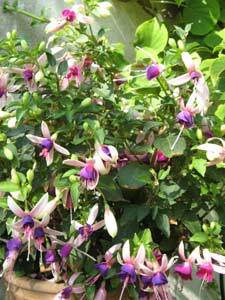 Fuchsia requires partial shade to grow and doesn’t rely heavily on sunlight to bloom. The red and pink florets of the plants are probably well known to everyone. You can plant these plants in early spring or wait until September to plant these. It’s one of the favorite perennials among most gardeners. The plant features five-petaled flowers that come in a variety of colors, like red, orange, pink, white, and many others. These flowers bloom in the months of January to April. These are low maintenance plants which can grow in all types of soils. For more ideas on shade-loving plants see our article on Finding the Best Plants to Grow in the Shade. Watering your landscape every day or twice a day is a very hectic task and needs time to be done. If you don’t have time to water the plants in your yard every day then you can also opt to plant drought-resistant plants in your yard. These plants don’t require watering regularly and can withstand harsh weather conditions as well. It’s a beautiful shrub that flowers in late winter or early spring that has flowers of purple or white color. This plant emits a very lovely fragrance that can fill in your landscape and refresh you every time you visit your backyard. These plants grow best on dry and sloping land, or it can be grown in front of any structure that could protect it from heavy winds. 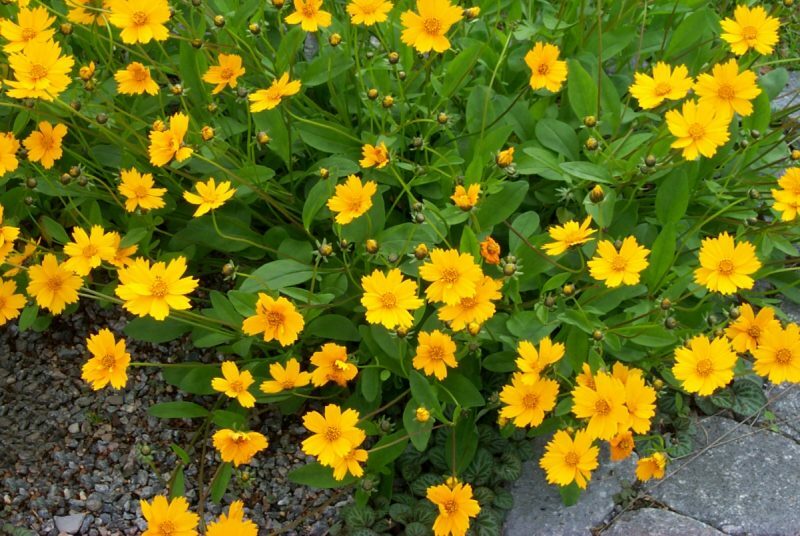 These perennials can add a burst of sunshine to your landscape with their yellow colored flowers. There are more than 100 species of the plant and all of them are low-maintenance and drought-resistant plants. These plants range from long and leggy to small and mounded, also these plants are easy to divide which will allow you to create more of them season after season. Using pots or containers to keep plants in your landscape not only makes your yard low maintenance but also provides you more versatility. Potted plants are mobile and can be kept anywhere in the yard depending on the plant needs. You can also color the pots and the containers to match your landscape surroundings. There are other advantages of putting your plants in pots, which include no weeding, flexibility, fewer disease problems for plants, time-saving, and many others. 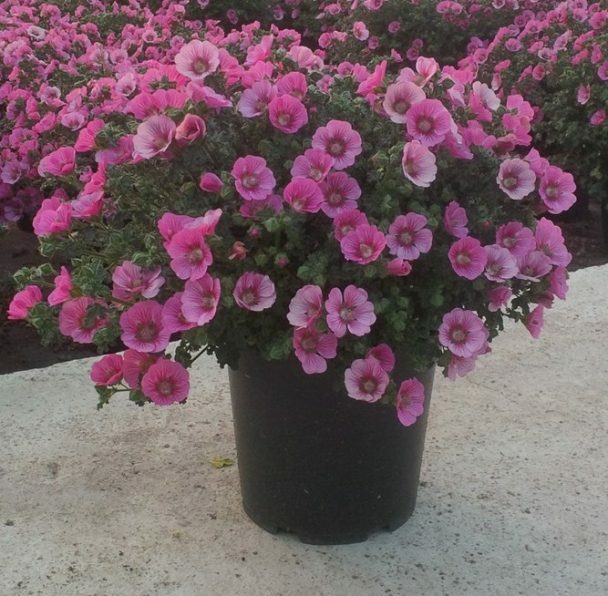 You can grow flowering plants, vegetable plants, bushes, shrubs, and many other kinds of plants in containers or pots that will make your yard beautiful and low maintenance. Commonly known as million bells, these flowering plants come in various colors that range from white to different shades of pink and purple. 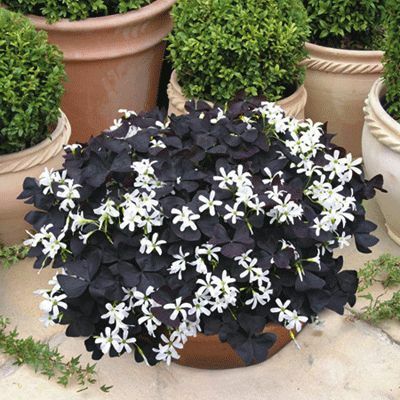 These plants look great in containers or pots and the flowers bloom and blossom throughout the summers. The plants can also attract hummingbirds and butterflies to your yard. 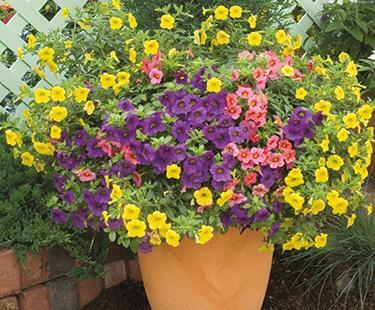 Calibrachoa can grow in any type of container and doesn’t require much maintenance. These plants grow flowers from spring and continue until fall. 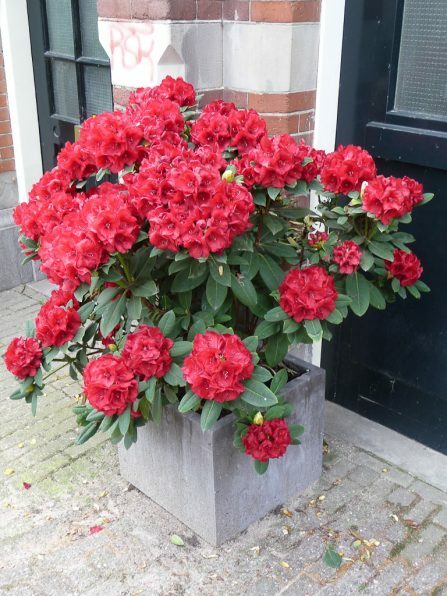 It can withstand very cold temperatures and is a tough plant that can blossom even in harsh weather conditions. It comes in several wonderful colors, from purple to dark green, black to yellow. You can place these plants in any type of container and make sure you place the containers in partial shade to complete shade. 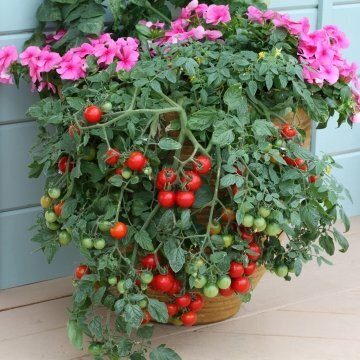 Tomatoes are undoubtedly the easiest and most productive vegetable that you could grow in containers. You can choose cherry tomatoes for your landscape yard since they look gorgeous and they require very little maintenance. Tomatoes need sunlight to grow, so you should keep the container in the sun for better yields. 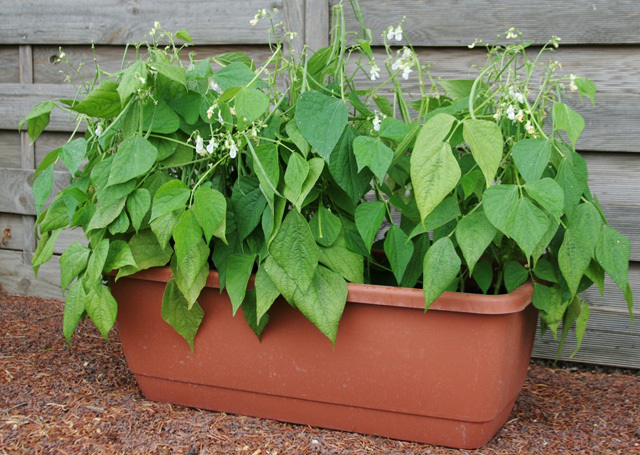 Beans are climbers and most of them grow upwards which makes it easier to plant them in containers. They can be grown near walls or a trellis and within a few weeks the plant will start growing and climbing giving a great view to your yard. Beans need the sun to grow and you should place the plant in sunlight. Find more tips on growing beans here. This is a perennial shrub that you could grow in containers and keep it in your yard. These plants start flowering in the late spring and early summer and continue flowering through the whole summer. 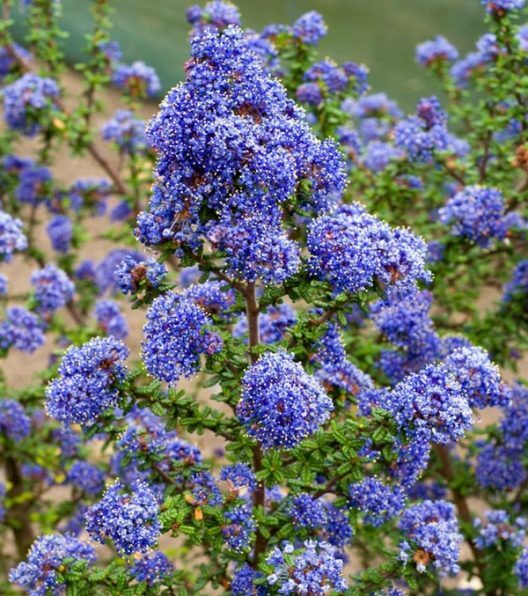 You can place these shrubs in full sun or partial shade this will get the plants to bloom. It’s a beautiful shrub that can grow both in hot and cold temperatures. The shrub flowers almost continuously in warmer regions, whereas in the cold areas flowering starts from summer to fall. These plants require full sunlight to grow and can be hung in containers in any place where there is ample sunlight. These are some of the plants, which you could grow in containers and keep in the yard to create a great and low maintenance landscape. You can place the containers of the same plant in a cluster to make them look beautiful. If you have stairs in your yard then you could place these plants on the stairs as well. Just make sure you keep the right plants in the right place. 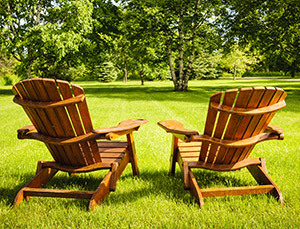 The first thing that comes to your mind when thinking about your yard or a landscape is the lawn. Most people tend to grow a variety of grasses in their yard, which they think is necessary for the landscape. However, grass requires maintenance, like watering twice a week, mowing, and others that can be time and energy consuming. If you have a bigger yard then things can go even worse because it becomes even more difficult to take care of. So, instead of mowing, watering, and taking care of the grass lawn, you can create spaces in your yard with no grass. This will not only limit the spaces you need to take care of, but will also provide extra space to create pathways, patios, fire pits, and many more things. A deck could be the perfect thing in your backyard that could add a whole new aspect to your landscape. Decks not only give you space to sit in your yard, but it also broadens the landscape outfit’s scope. 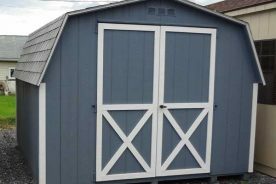 These are made from soft wood, composite materials, and aluminum, which are long lasting and require very less maintenance. Decks can be used as a sitting area, and they can provide a great view of your landscape. You can put sofas and chairs on the deck and enjoy your evenings and mornings overlooking your beautiful landscape. A patio is generally referred to an outdoor space, which can be used for recreation and dining. Patios are generally paved with concrete and stone slabs, and they can also be created by using bricks, tiles, and cobbles. 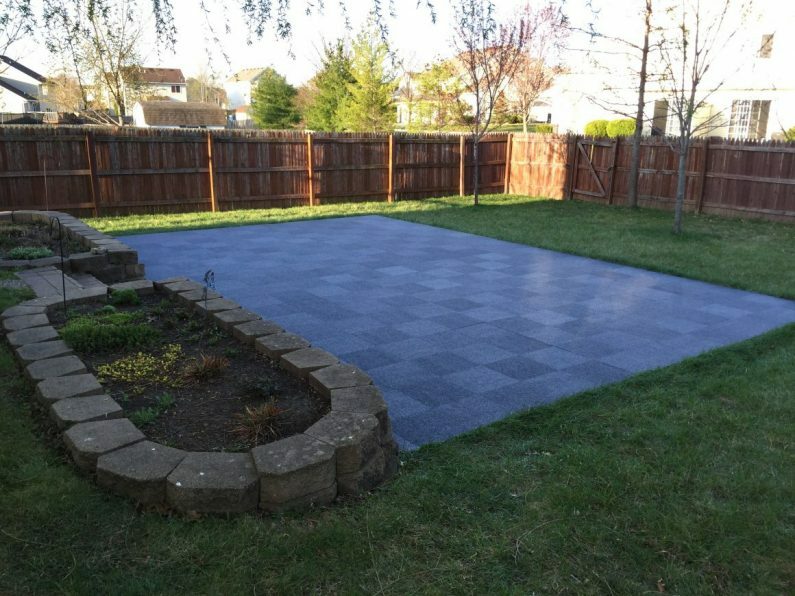 The patio provides a great space for relaxing and provides ample area for the kids to play as well. Just place few furniture pieces or beanbags on the patio and there you have a great place to relax in your landscape. You can use the patio for other purposes as well such as a dining area, you could have your grill out and make it your grilling spot, and you could even place a carpet on it and make it a great place to relax. A fire pit space in your yard is a great factor that adds to the beauty of your yard. You can use the fire pit in the winters to keep yourself and the surrounding warmer. This will also help in keeping the plants in the yard warmer. The fire pit can also be used for cooking food with friends and family and spending quality time with them in the yard. Mostly the fire pit spaces are constructed in granite and are very sturdy requiring minimum maintenance. If you have kids in your house, then creating a playing space in your yard for them is not a bad idea. This will add to the charm of your landscape and will also add up to the areas which don’t require regular maintenance. 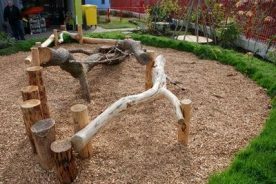 The kids playing area can be a simple area filled with sand where the kids can play or you can also add things, like seesaw, slides, and playsets to make the space more interesting for the kids. Mulch refers to a layer of material that is applied to the surface of an area of soil to conserve moisture and improve fertility and the health of the soil. It’s not necessarily organic in nature and may be permanent or temporary. 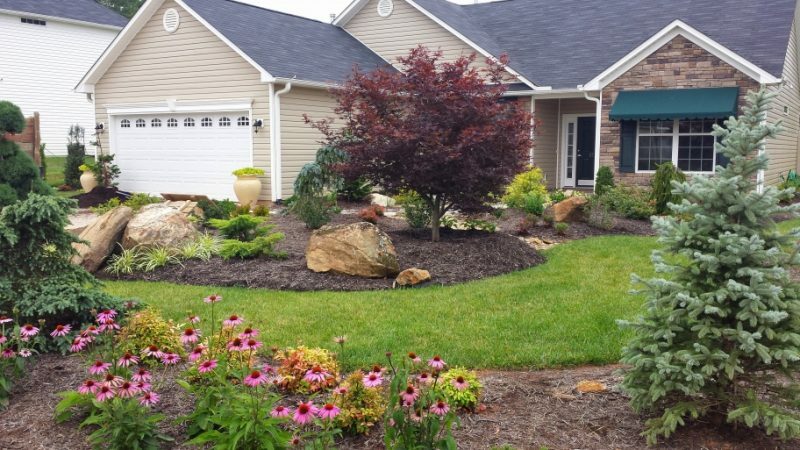 Mulch is not a fashionable starlet that steals the spotlight in your yard, but its performance can be decisive in making or breaking a landscape design. 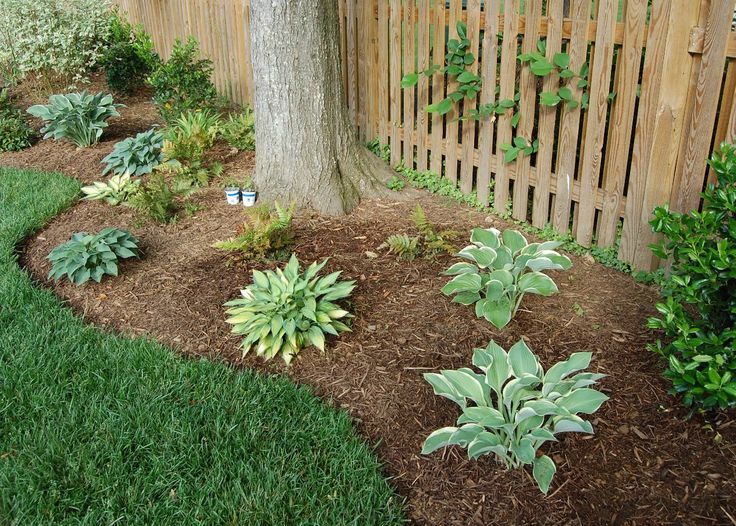 You can use mulch around plants, bushes, and trees in your landscape. This will make sure that the soil near the plants stay intact and doesn’t lose its fertility. Mulching around the plants and trees will also make sure that there is no erosion or soil loss during heavy precipitation. It will also help in keeping the moisture levels intact in the soil. It’s one of the most common and least expensive types of mulch that is used extensively in landscapes. These are very good to be used on slopes and are organic and environment-friendly. Leaves make good mulches generally in winters. So don’t just throw or burn away the fallen leaves store them and use them as mulch to cover the soil. Straw being very slow in breaking down then leaves, makes great mulch. Its golden color also gives your landscape a great look. However, you should make sure that there are no weed seeds on the straws to prevent them from growing. Compost looks like soil, which makes it a good choice of mulch for your landscape. This mulch breaks down very quickly and adds to your soil structure very fast. Furthermore, it’s inexpensive and you can create your own rich compost for free through various methods. Plastic mulch: It’s an inorganic mulch which uses plastic. You can manually lay down the plastic over the soil. This will keep the moisture intact in the soil and not let the water evaporate easily from the soil. However, the looks of plastic are not premium and it can also heat up the ground very fast. It slows down the process of water evaporation from soil, which means you don’t have to water your yard as often. It acts as an insulator of soil against temperature extremes. This protects the plants in cold regions and also in hotter regions. It acts as a barrier and slows down the flow of water from precipitation and helps reduce soil erosion. It prevents disease organisms to go up to the plants and also prevents unwanted weeds from growing in the soil. Using these mulches will ensure that your landscape has a polished design and all the plants present in your yard stay intact. This is why mulching is one of the most important aspects of creating a low maintenance landscape. Artificial turf is generally plastic or synthetic artificial grass that can be used as artificial lawns in landscapes. If you have kids and pets in the home and you fear that they might destroy your natural turf, then you can use artificial turf. Artificial turfs also take maintenance out of the equation as they don’t require watering, mowing, and other things that are a must for natural lawns. Artificial turfs are very sturdy and don’t require much maintenance. Since most of the artificial turfs are made from synthetic and rubber materials, they last long and don’t get destroyed easily. They don’t even need watering and mowing, which makes them a must for people who don’t have time to spend on their yards and landscapes. 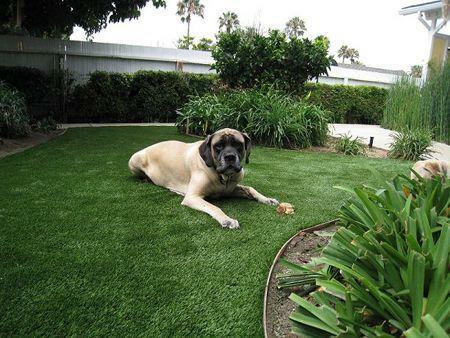 Furthermore, unlike natural grass turfs, the artificial turf doesn’t require fertilizers and pesticides. This saves a lot of your money and a lot of effort as well. 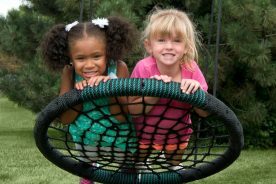 Generally, kids and pets tend to play on the natural grass and destroy it by digging or pulling the grass out, but when you use artificial turf, you needn’t worry about these things. Kids and pets can play on the turf and can cause very less damage to the turf and even themselves as the artificial turfs come with a soft rubber base. The installation cost of the turf is very high, unlike the natural turfs which could be grown at very minimal costs. You might also need the help of experts to place the artificial turf in its place. This is a great problem associated with the artificial turfs. Since the artificial turfs are made from synthetic and rubber, they tend to absorb heat from the sun and don’t let it out so easily. On a bright and sunny day the artificial turf can heat up very fast and it might be very difficult to walk on it. Many artificial turfs are believed to release harmful chemicals into the air when heated. Although, artificial turf creators have long argued this fact, but the truth is the artificial turfs might have some health issues. You can use the artificial turf in the areas where there is heavy foot traffic. 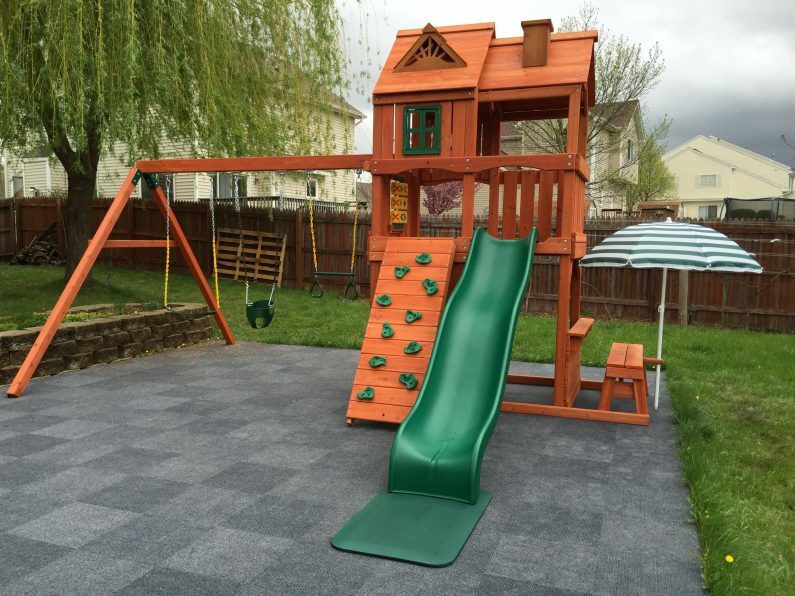 You can also use the artificial turf in the play area of your kids and pets. Landscaping your yard is a great way of creating a masterpiece in your own home. Landscapes not only provide a great feel to your house and yard, but also they provide a relaxing feeling to you after a busy day. Follow the above given ideas about creating a low maintenance landscape and create the landscape that you’ve been longing for without needing to spend much time and effort on it.